Waldo died in 1759, and his heirs would sell the plantation of Passagassawakeag (named after its river) to 35 Scots-Irish proprietors from Londonderry, New Hampshire. Renamed Belfast after Belfast, Northern Ireland, it was first settled in 1770, and incorporated as a town in 1773. The village was mostly abandoned during the Revolution while British forces occupied Bagaduce (now Castine). The British military burned Belfast in 1779, then held it for five days in September 1814 during the War of 1812. Following the war, the seaport rebuilt and thrived. 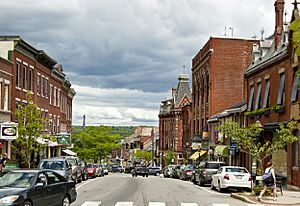 It was a port of entry, and designated county seat of Waldo County in 1827, although land would be set off in 1845 to form part of Searsport. 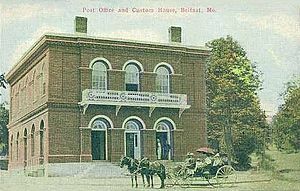 Belfast was incorporated in 1853 as a city, the 8th in Maine. It developed into a shipbuilding center, producing hundreds of three, four and five masted schooners. 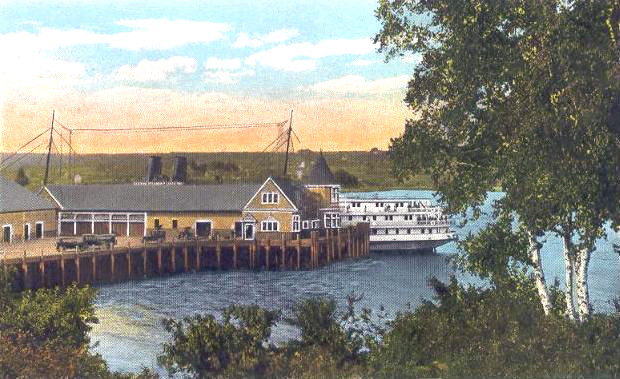 Materials for wooden boat construction were shipped down the Penobscot River from Bangor, the lumber capital of North America during the later 19th century. Shipbuilders became wealthy, and built the Federal, Greek Revival and Italianate mansions and civic architecture for which the city is noted, including the 1818 First Church by master-builder Samuel French, and the 1857 Custom House and Post Office by noted architect Ammi B. Young. Wooden ship construction would fade about 1900, but with the advent of refrigeration, the local economy shifted to harvesting seafood, including lobsters, scallops, sardines, herrings and mackerel for the Boston and New York markets. The Belfast rail yard in 1875; MEC-built station house c1880. 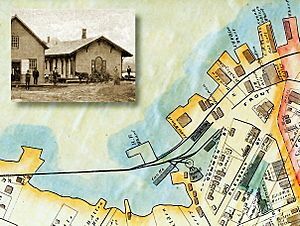 A county wide connection to the main line of the Maine Central Railroad at Burnham 33-miles inland from Belfast was established by the largely city-owned Belfast and Moosehead Lake Railroad with its opening in 1871. For the first 55 years the line was operated under lease by the MEC as its Belfast Branch but its operation reverted to the B&ML on January 1, 1926, when the lease was terminated by the larger road. Regular passenger service ended in 1960, and all operations in Belfast of any kind ceased in 2005, when the main yard was torn up. In 2011 the grounds of the former B&ML main yard and adjacent Stinson Seafood factory became the site of the Front Street Shipyard. The railroad's 1946 vintage engine house was torn down and its site is now occupied by the shipyard's 26,500 sq ft, five story boat building and repair facility. Shoe manufacture became an important business. After World War II, however, the Belfast economy was driven by its poultry industry, including 2 of the state's larger processors, Maplewood and Penobscot Poultry. Waldo County farms supplied the factories with up to 200,000 birds a day. The annual Broiler Festival became a popular summer event, attracting both local people and tourists. But the poultry business collapsed in the mid-1970s during a national recession, devastating the city and surrounding towns. In the early 1980s, the defunct chicken-feed silos at the foot of Main Street, that once fed millions of chickens, were demolished. There was an exodus of people seeking employment prospects elsewhere through the 1960s, 1970s and 1980s. But as they left, people attracted to the natural beauty of the coast of Maine, inexpensive land and homes, some who came to go "back to the land", artists and young college graduates moved in starting a renaissance. In the early 1990s, credit-card giant MBNA established two facilities in Belfast, one considerably larger than the other. 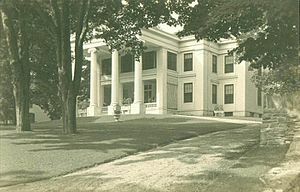 The company was instrumental in establishing the Hutchinson Center of the University of Maine, an outpost of the University of Maine System, less than a mile from the main MBNA campus. Jobs provided by MBNA, which was recently acquired by the Bank of America, helped increase Belfast's population significantly. Bank of America consolidated former MBNA operations in the larger of the two facilities. The smaller complex was eventually taken over by athenahealth. In 1996, shipbuilding was re-established on the Belfast waterfront with the opening of French & Webb, Inc., classic wooden yacht builders and restorers. Following in their footsteps, Front Street Shipyard opened a major boatyard on the Belfast Bay in 2013. Together, the two boat-building companies have restored Belfast's working waterfront and helped revive the city economy as well as appeal to tourists. Movies filmed in Belfast include Peyton Place (1957), Thinner (1996) and In the Bedroom (2001). Belfast is located at (44.425896, -69.011646). According to the United States Census Bureau, the city has a total area of 38.37 square miles (99.38 km2), of which, 34.04 square miles (88.16 km2) is land and 4.33 square miles (11.21 km2) is water. Situated on Penobscot Bay, Belfast is drained by the Passagassawakeag River. Other smaller rivers include Goose River and Little River. 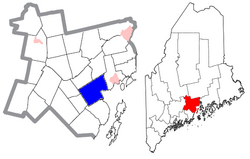 Belfast is bordered by Waldo and Swanville to the north, Searsport to the east, Northport to the south, Belmont to the southwest and Morrill to the west. It is served by US Route 1, Maine State Routes SR 3, SR 7, SR 52. SR 137 and SR 141. This climatic region is typified by large seasonal temperature differences, with hot and humid summers and cold and dry winters. According to the Köppen Climate Classification system, Belfast has a humid continental climate, abbreviated "Dfb" on climate maps. As of the census of 2010, there were 6,668 people, 3,049 households, and 1,729 families residing in the city. The population density was 195.9 inhabitants per square mile (75.6/km2). There were 3,582 housing units at an average density of 105.2 per square mile (40.6/km2). The racial makeup of the city was 96.7% White, 0.5% African American, 0.4% Native American, 0.4% Asian, 0.2% from other races, and 1.8% from two or more races. Hispanic or Latino of any race were 1.2% of the population. There were 3,049 households of which 24.1% had children under the age of 18 living with them, 41.4% were married couples living together, 11.5% had a female householder with no husband present, 3.8% had a male householder with no wife present, and 43.3% were non-families. 35.9% of all households were made up of individuals and 17.8% had someone living alone who was 65 years of age or older. The average household size was 2.14 and the average family size was 2.73. The median age in the city was 46.9 years. 19.9% of residents were under the age of 18; 6.1% were between the ages of 18 and 24; 21.4% were from 25 to 44; 30.6% were from 45 to 64; and 21.9% were 65 years of age or older. The city's population was 46.2% male and 53.8% female. As of the census of 2000, there were 6,381 people, 2,765 households, and 1,692 families residing in the city. The population density was 187.5 people per square mile (72.4/km²). There were 3,121 housing units at an average density of 91.7 per square mile (35.4/km²). The racial makeup of the city was 97.56% White, 0.28% African American, 0.27% Native American, 0.28% Asian, 0.02% Pacific Islander, 0.27% from other races, and 1.33% from two or more races. Hispanic or Latino of any race were 0.69% of the population. There were 2,765 households out of which 25.8% had children under the age of 18 living with them, 46.8% were married couples living together, 10.8% had a female householder with no husband present, and 38.8% were non-families. 31.5% of all households were made up of individuals and 13.3% had someone living alone who was 65 years of age or older. The average household size was 2.23 and the average family size was 2.77. In the city, the population was spread out with 20.9% under the age of 18, 7.5% from 18 to 24, 24.2% from 25 to 44, 27.3% from 45 to 64, and 20.0% who were 65 years of age or older. The median age was 43 years. For every 100 females there were 87.4 males. For every 100 females age 18 and over, there were 83.0 males. The median income for a household in the city was $32,400, and the median income for a family was $43,253. Males had a median income of $30,514 versus $27,518 for females. The per capita income for the city was $19,276. About 10.0% of families and 13.2% of the population were below the poverty line, including 19.5% of those under age 18 and 9.1% of those age 65 or over. Belfast, Maine Facts for Kids. Kiddle Encyclopedia.